Given the unique nature of your smile, receiving care to achieve optimal oral health and dental beauty should be a personalized experience. This belief is at the heart of Dr. Lawrence M. Saltzman’s care as he provides skillful diagnosis and treatment in an accommodating environment. Addressing issues ranging from discolored teeth to obstructive sleep apnea, our practice offers quality dental services for patients in Duluth as well as nearby Johns Creek, Norcross, Lilburn, Suwanee, and Lawrenceville. 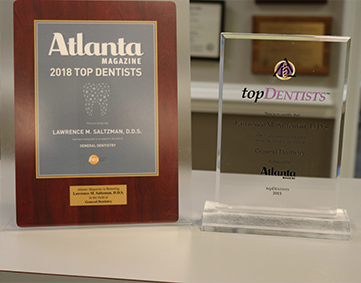 While Dr. Lawrence M. Saltzman combines his love for science and artistry to help patients achieve their ideal smile, what he enjoys most is helping each person gain improved wellness. Dentistry gives insight into systemic health as a whole, and our dentist takes into consideration your overall health when developing a comprehensive treatment plan. Every recommendation our Duluth dentist makes is determined by what is most beneficial for your oral health now and in years to come. After presenting all available treatment options, Dr. Lawrence M. Saltzman makes sure you have the opportunity to make an informed decision. At every step of the way, he makes sure that care proceeds at a pace that ensures your comfort and confidence. No matter if you’re coming to us for the first time or are bringing your family in to see Dr. Lawrence M. Saltzman, you can expect a warm greeting as soon as you walk into our Duluth office. We cherish getting to know our patients personally, having developed a reputation for forming strong bonds. Our existing patients take comfort in seeing familiar faces at each visit, as most members of our exceptional staff have been with the practice for at least 25 years and our three hygienists for more than 30 years. Our care philosophy is centered on giving each individual the respect they deserve. From our perspective, we find it more gratifying to treat people, not diseases. Searching for Dental Care Delivered with Compassion? Give us a Call Today! Dr. Lawrence M. Saltzman and his team invite patients to discover the difference a relationship-based treatment approach makes. 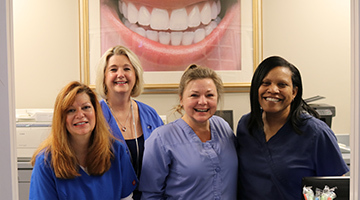 Contact our office and schedule a consultation to learn about the array of dental services we provide for families in Duluth and surrounding communities, including Johns Creek and Lawrenceville. TMD can greatly affect an individual's oral and overall health by preventing them from utilizing their smile to their fullest capabilities. This innovative and permanent treatment allows you to conceal imperfections, whether inherited or caused by habits and dental trauma. At Lawrence M. Saltzman, DDS, we help patients regain confidence when it comes to the appearance of their teeth by offering Zoom! ® Teeth Whitening. 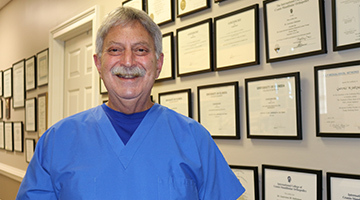 Dr. Saltzman performs root canals in Duluth, GA for patients experiencing inflammation and chronic dental pain, all in the interest of saving their tooth and securing their overall health. Dental implants are like having new teeth. Going from a removable appliance to implant-supported restorations is like night and day; patients notice the difference right away! Dr. Saltzman and his staff are the best, most caring folks that you will ever meet. My family has been going to his office for dental care for twenty years, and have always received the best treatment possible. Courtney and Kathy are wonderful. Dr. Saltzman truly is concerned about your experience, and not only is he extremely professional and thorough, but very gentle, which really is appreciated when extensive invasive dental work is being performed. I cannot imagine going anywhere else. Consistently great service by competent and friendly individuals in every role! I actually come to Dr. Saltzman's office expecting laughter, a family setting, and absolutely no pain. I now drive over an hour to reach this office. I'd drive twice the distance just to be treated there.